Welcome to the five hundred and fourth of my blog interviews with novelists, poets, short story authors, biographers, agents, publishers and more. Today’s is with non-fiction author Anne O’Connell. A list of interviewees (blogged and scheduled) can be found here. If you like what you read, please do go and investigate further. Morgen: Hello, Anne. Please tell us something about yourself, where you’re based, and how you came to be a writer. 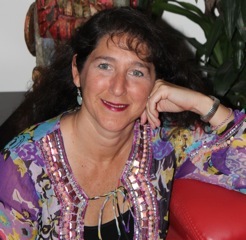 Anne: I am a freelance writer based in Phuket, Thailand and I’ve been an expat since 1993 when my husband and I escaped the ‘great white north’ (Canada) for the sun and sand of Fort Lauderdale, Florida. We lived there for 14 years and then moved to Dubai in 2007. Then, in 2011, it was time for another adventure so we moved to Thailand. I can’t remember when I ‘became’ a writer. I think I was born to write. I worked in PR from 1990 to 2007 and 90 per cent of my job was writing. When we moved to Dubai I needed a change and didn’t want an office job anymore so I decided to work from home and started freelance copy writing. Morgen: It’s funny, I’d say about half the authors I’ve spoken to have said they’ve always been destined to be a writer, either starting young or wanting to but taking a few years to do so. I didn’t have a clue when I was younger that being a writer was a profession (despite reading prolifically) and only had my light bulb moment when attending a college workshop. You write non-fiction, how do you decide what to write about? Anne: Most of the time my clients dictate what I’m going to write about. Because my expertise was in corporate communications, marketing and PR I’m drawn to clients who have a need in those areas. What I write is determined by their target market, what needs to be communicated and the vehicle by which the message will be delivered. For my own writing (my blog or online articles) I like to write about trends in business communications or simply what I experience going on in the world around me. I love to travel so I balance the business writing with things that are a little more on the lifestyle side. Morgen: They do say to write what you know and worldwide experiences will always be popular. What have you had published to-date? Do you write under a pseudonym? Anne: Everything I write is under my own name and I have two books published. One is a country guide on Dubai published by Summertime Publishing called @Home in Dubai… Getting Connected Online and on the Ground and the other one is 10 Steps to a Successful PR Campaign – A Do-it-Yourself Guide for Authors, which I self-published. Morgen: What lead to you going your own way with that book? Anne: I’ve had a wonderful experience with my publisher and I hope to work on more projects with her down the road. The reason I self-published 10 Steps is because it was originally meant as a free download from my website but while I was writing it, I was also researching publishing options for a novel I’m working on and did a few webinars on publishing eBooks (specifically on Kindle). I recently did one with Kathleen Gage, The Street Smart Marketer and it was awesome! Anyway, I realized it would be a perfect little book to test out what I had learned. Morgen: That’s the great thing about self-publishing (especially with eBooks). Are your books available as eBooks? Do you read eBooks or is it paper all the way? Anne: Both books are available as eBooks on Kindle or as PDF downloads on my website. I love my e-reader, especially when I travel, but I still think there’s nothing like holding a paperback novel in your hand either on the beach or propped up in bed. Morgen: That’s true. I’d say 99% of the people I speak to say the same. Bookshelves would look silly without books. Did you have any say in the titles / covers of your books? How important do you think they are? Anne: Titles and covers are critical. Both will make or break your book, no question. I say this more as an avid reader than an author since I’m pretty new at that but I’ve been a passionate reader since I was very little. The book cover is almost more important than your back cover blurb or synopsis. If that ‘thousand words’ the picture is painting doesn’t grab the reader’s attention, they won’t even get to the few hundred in the description. I was very involved in determining the title of my first book and was asked for my input for the cover design. I loved the one that was proposed so that made it easy. The title and cover of the book I self-published was totally my call. Morgen: Given that online you have such a small cover to work with it must ‘sing’. What are you working on at the moment / next? Anne: I’ve got a nice balance going on. I’m working on some website copy for a new community lifestyle website for Dubai and I’m also putting the finishing touches on my first novel. Morgen: Maybe you could come back for an author spotlight when they’re done. Do you manage to write every day? Do you ever suffer from writer’s block? Anne: I have no choice but to write everyday. It’s what I do for a living, which is great, since I’m totally addicted to writing. If I have a block when I’m working on one project, I just take a break and go for a walk on the beach, make a cup of tea or switch to another project for a bit. One of those usually loosens it up. I sometimes count on my muse, my cat Zorro, to help get the creative juices flowing. Morgen: My mum said to me recently “don’t let writing take over your life”. I didn’t like to tell her she was a few months too late. 🙂 Do you do a lot of editing or do you find that as time goes on your writing is more fully formed? Anne: I’m constantly editing. As time has gone by I’m probably better at getting thoughts and ideas formulated and down on paper more quickly but every time I re-read something I’ve written there’s always a little tweak or change that can be done. Deadlines are good because at the eleventh hour, you just have to close the document and hit send! Morgen: Aren’t they. If I’m ever asked to do anything I dread hearing “no hurry” as it’ll be weeks (or months) before I get round to it. The oldest email currently in my inbox is from March (actually I have three from March and three from April, more from subsequent months – I’m very lucky that people are so patient… either that or they’ve forgotten). Do you have to do much research? Anne: The amount of research I do depends on what I’m writing. I’m always absorbing my surroundings, reading and learning. A feature article often requires secondary research and interviews but there’s less research required if I’m doing an opinion piece like a column or a blog but I’ll still sometimes pull in supporting background (properly attributed, of course). As I’ve been writing my novel I’m constantly verifying facts (historical, geographical, industry, etc.) and that is part of the research process. Morgen: It is, and it’s best done as someone will pick you up on it. Do you have pieces of work that you think will never see light of day? Anne: Several! I’ve outlined so many book ideas that I’d have to live to 100 to get them all done. Morgen: I’m the same with my fiction, although writing a story a day does help work through some of them. 🙂 Have you had any rejections? If so, how do you deal with them? Anne: I’ve been sending out proposals and inquiry letters for two books for a while now. I don’t have representation yet so I have had many rejections. I just file them away and move on to the next one on the list. Morgen: The best way to be… until you find the right person for the ‘right thing’. How much of the marketing do you do for your published works or indeed for yourself as a ‘brand’? Anne: I market myself, as a brand, and my books every single day. It’s second nature for me since my background is in PR and marketing. I have been developing my online platform for about four years now but the learning curve doesn’t seem to change because there’s always something new to explore. I have websites, Facebook pages, a LinkedIn profile and a blog. I tweet, write articles, do guest blogs, join forums, do workshops, contact book shops, join professional associations, send out review copies, did a blog tour and manage my Amazon profile. Morgen: Wow, and you still have time to write. What’s your favourite / least favourite aspect of your writing life? Has anything surprised you? Anne: There’s really nothing I don’t like about my writing life. I’m very fortunate to be able to write full-time and I’m living in paradise with lots of inspiration. What has surprised me the most is how much I’m enjoying writing fiction. Morgen: Me too, but then I grew up writing nothing but. All the non-fiction I write is about writing. 🙂 What advice would you give aspiring writers? Anne: Write something every day, even if it’s a list, an idea, an outline, bullet points or a mental dump. If you wake up with an idea, write it down immediately. Keep note pads (paper or electronic) everywhere. It’s something that gets under your skin so be ready to enjoy the feeling. It’s like exercise. You might not feel up to it at the moment, but once you get rolling, you’ll feel so much better. When the words start to flow and a piece of prose comes together you can feel the endorphins releasing, and you don’t even have to lace up your sneakers. Although sometimes exercise will help clear the brain or trigger ideas. I’m a yoga buff myself. Morgen: I soon learned to have a notepad and pen in every dog-walking jacket, having lost a ‘brilliant’ idea. 🙂 What do you do when you’re not writing? Anne: When I’m not writing I’m reading, managing my social media network, walking on the beach, traveling, exploring with my husband, watching movies, playing with the cat, doing yoga or visiting with friends. Anne: There are a few LinkedIn groups that I’ve joined and really enjoy the discussions. They often overlap onto Facebook and Twitter as well. It’s easy to find like-minded people who are eager to share experiences and resources. Morgen: LinkedIn could be how we met. I was running low (a week’s worth) on interviewees back in February so put a shout-out and was inundated. I’ve just deleted it as I’m now booked into next May plus over 900 questionnaires not yet back. What do you think the future holds for a writer? Anne: I think the future is very bright for writers. There are a multitude of platforms, traditional and new age that will always need quality content and original thought. More and more writers are working remotely so there are no geographic boundaries anymore either. With the explosion of self-publishing options, it’s even more encouraging. Morgen: Isn’t it great. Where can we find out about you and your writing? Anne: My main freelance writing website that links to everything is www.anne-oconnell.com. Anne: Yes…what is your favourite writing genre and style and why? Morgen: Oh my goodness, there’s a question. I say I write ‘dark and light’ but it tends to be darker than lighter – crime and humour. Some of my Tuesday Tales are pretty grim. I’m not sure why but I used to read Stephen King in my teens. I had a very normal upbringing and nothing terribly earthshattering has happened since so maybe my brain just wants to see how bad life can be. 🙂 That said, I love writing comedy so I’m (hopefully) fairly balanced. Thank you, Anne. From getting a work permit to finding a WiFi hotspot… or even connecting with a fun sport or social group, @Home in Dubai… Getting Connected Online and on the Ground has the inside scoop on how to get it done. Knowing the drill is half the battle and author, Anne O’Connell, and other expats who weigh in with their advice and experiences, are happy to share a few ‘how tos’, with any and all newcomers. “Reading Anne O’Connell’s’ @Home in Dubai is like sitting down with a friend over a cup of coffee and having all your questions answered,” said Zvezdana Rashkovich, author, Dubai Wives. “It’s a much-needed hospitable host, who agrees to hold your hand through the raw and rough days of migrating to a new country,” adds Suchitra Chaudhary, senior feature writer for Gulf News’ Friday Magazine. Since 1990, Anne O’Connell has been managing the communications needs for corporate and non-profit organisations, beginning her career with the international PR firm of Burson-Marsteller. Subsequently, she held communications positions in the fields of higher education and health and wellness as well as in PR agencies and the news media. Prior to going freelance in 2007, she managed fundraising and public relations for a regional educational television station in South Florida. Currently, Anne is working as an independent consultant providing strategic and creative writing services and training programs for clients in both private and non-profit sectors in a multitude of industries. She is also the author of @Home in Dubai…Getting Connected Online and on the Ground and 10 Steps to a Successful PR Campaign – A Do-it-Yourself Guide for Authors. Anne received her bachelor of Public Relations from Mount St. Vincent University in Nova Scotia (Canada) in 1990. As a professional communicator and grass roots community advocate she strongly believes in giving back and has always looked for ways to volunteer her services as part of her daily life. 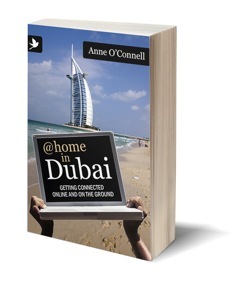 Visit Anne’s website at www.anne-oconnell.com and learn more about @Home in Dubai at www.athomeindubai-gettingconnected.com. Hi thanks Siggy but this is a comments area (ideally for Anne’s interview) so it doesn’t take attachments. Can you email me please. Thanks. This interview made me smile. It reminded me of myself when discovered writing was a profession. Almost by accident. Good stuff. Happy Friday! Thanks Gerald! Writing for a living sure makes me smile too.